Writing the first post at the end of an absence is the hardest thing. It’s not about working out where to start per se but, it’s more about avoiding the endless list of excuses as to why this has happened. This is not so much to make my readers feel some kind of sympathy for me, more to do with appeasing my own guilt at having been so neglectful. Ok, that’s the bit about feeling bad done with. There is one big excuse though. You may have noticed in a couple of the pictures from the last post that I’m standing in front of a rather untidy brick wall. Well, that was the remains of my kitchen and was taken at a time when we had just embarked upon a major overhaul of the house. Various building works to remove some walls, make holes in others and finally fit a new kitchen were already turning our lives upside down. It went on for quite a few weeks. To finish everything off it was down to me, a form of self selected masochistic punishment, to build some big floor to ceiling cupboards, box out the under stair area and fit bookcases, all after redecorating the whole of the ground floor. It took a while and consumed my life until well after Christmas. All done now, until I need to get cracking on the first floor. A smaller project that one. I was still doing some drawing but not making the effort to blog about it, so I’ll shed some light on what I’ve been up to on that front over the following posts. The photo above is of three black and white reductive ink drawings that were done after doing the t-shirt for my local bike shop (they sell like hot cakes by all accounts, which is good to hear). I have a contact in the US who fancied some designs for shirts of his own, having seen the blog post, so I set out to see what I could rustle up for him. Two of them made it through to printing and can be found in the apparel section of his web shop here, http://carpyscaferacers.com. They look pretty good combined with his type work so I’m hoping they’ll sell well and more work comes of it. These next two pictures are really to shed some light on my process and show the preliminary sketches I do for these pictures so that you can see where things come from and how they change and develop as I move them through to inking them up. I invariably reach for my favourite blue biro for preliminary sketches, for no other reason than they’re lovely to use and one can achieve such a variety of line weights. This helps hugely when I want to move a line or change details. These are then traced off on the light box, making changes along the way, to give me a base drawing that I can then ink over. It may seem rather a long process, repeating a drawing two or three times but, it’s the best way to get it how you want it. The downside is that this is one of the main reasons why these drawings take so much time. As before the inking is done with Rotring and Steadler technical pens so that I can maintain as crisp a line quality as possible and there is no ink bleeding on the thin Bristol Board I use. Because the ink is similar to Shelac based Chinese ink, it is very black which is a great help. You don’t have to go over everything twice to get great opacity and it’s just about sturdy enough to cope with tidying up the drawing with a small eraser after you’ve finished. The creation of printable artwork for shirt printing requires these drawings to be scanned and converted to vector paths in a graphics package, so the cleaner and crisper the initial scan the better. I’ll talk more about the whole vectorising thing in a later post. I hope you like todays pictures and thanks for visiting the blog. A good pen is an expensive tool, look after it. 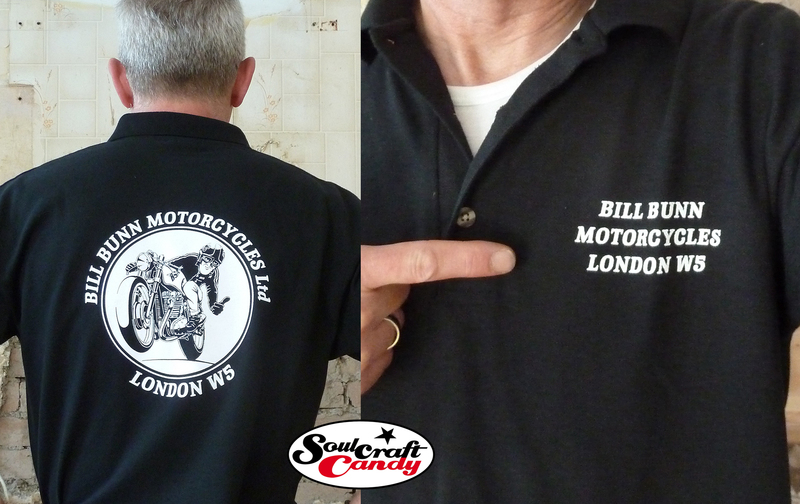 The finished workshop polo shirt. 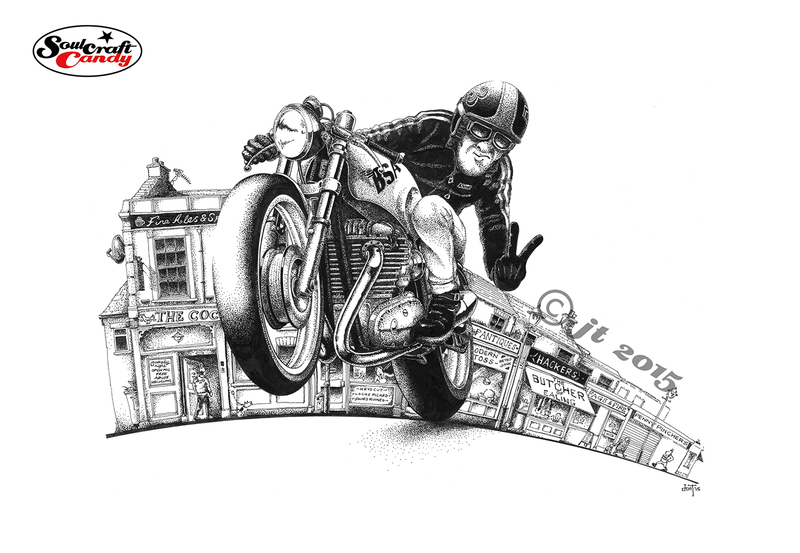 So here is the shirt design for Bill Bunn Motorcycles, my local bike shop, in its finished form. The guys very kindly gave me a polo shirt in way of payment, which makes one feel very good about the idea of bartering. The quality of the screen printing is really good and the level of line and detail they have managed to keep is very high. A great result. This black and white block reductive drawing is becoming strangely addictive. Partly I think it has to do with the process being quite quick, you see results quite fast but, it also has much to do with the simple pleasure of pen use and the decision making process. Areas of the drawing are either black or white and that’s it, this way or that, simple. As more drawings take shape it becomes easier to decide which way to go, ones ability to “see” what gets left out becomes clearer. It is amazing how the eye and brain are able to build a complete image from only a rather basic framework of information. This activity is also helping me to complete some drawings which have been lying dormant in the drawing chest because I couldn’t decide on how to finish them. This indecision invariably comes from a lack of confidence and a worry about messing something up having invested a great deal of time and effort into it. For some reason this temerity seems to disappear once I start thinking of completing them in this style. One example is the drawing above. It must have sat in the drawer for about a year while I dithered over the final execution. 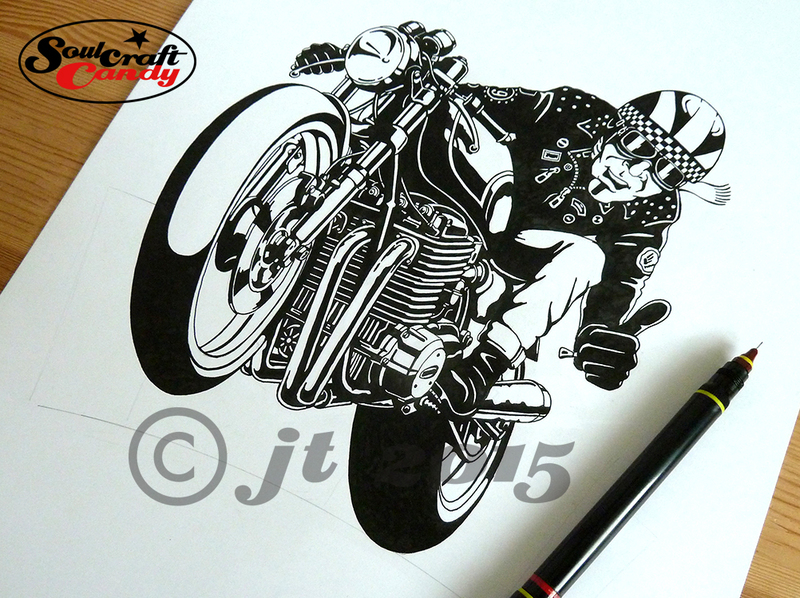 However, armed with a couple of freshly filled Rotring pens it all came together rather quickly. there is still some background to complete to bring it on a bit further but essentially a neglected work has taken on new life. One aspect of working in this way is that I’ve realised that I actually have a rather unhealthy pen fetish! I’m actually a bit of a technical pen nerd in reality. It is a necessary part of using these things that one has to be rather fastidious about their cleanliness in order to get the best out of them, and I find myself enjoying this often messy job. There’s something terribly satisfying about making the first lines after a thorough clean and refill of my most oft used pen. What strikes me as a bit excessive is why I have to have so many of the things? At least a dozen at the last count, though not all are in working order. Long neglected at the bottom of a drawer, one or two are utterly dried up and solid with ink residue, a rock hard shellac like substance that seems to be impervious to most solvents. Prolonged soaking in cleaning fluid, often weeks, helps to release things but often the smaller sized nibs are beyond help. I have no idea why I have so many, like many bits of drawing equipment we just seem to accumulate them unwittingly over time. 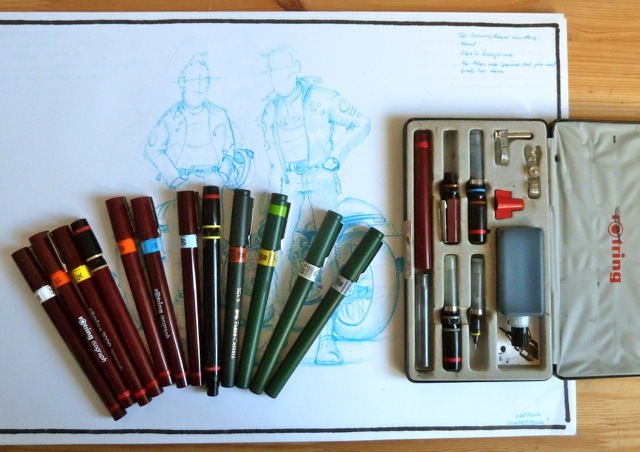 I remember purchasing my original Rotring box set over 30 years ago, second hand from a market stall but where the others have come from is anyones guess. Likely bought because I’d forgotten I had that size already or they were so bunged up I just went and got a new one rather than bother cleaning them out. Profligate and lazy days to be sure. One thing being a freelancer teaches you though, is looking after your stuff so hopefully m nibs can look forward to a more pampered and productive life from here on. Dot shading and the tale of two fingers. We’ve all done this at some point surely? It has often crossed my mind that there is something mildly masochistic about certain aspects of pursuing a creative life. Obviously there are all of the usual traits that we exhibit like the vocational tug toward a certain specialism, the need to express ourselves, a slavish attention to detail and a preparedness to burn the midnight oil to meet a deadline but, there is also this uncontrollable little monster that drags you back toward things which make you uncomfortable and disinclined to take an idea forward. I’ve come across lots of these over the years and generally, once one succumbs to the temptation (can’t think of a better way to put it) you find you’re off on another journey that prior to that moment you said you’d never take again. And oddly, you’re quite enjoying the trip. These are perhaps slightly too strong words to describe it but I think it’s true nonetheless. The little monster that is the subject of todays post is dot shading. I’ve written about the challenges of using this technique before, it is incredibly time consuming and can sap your will power if you let it, and have even gone as far as saying I wouldn’t use it again. But you see, and this is where the masochism comes into play, for some reason I just can’t resist it. It is an utter monster of a technique but, and this is where it really gets you, it just gives great looking results, pure and simple. Never say never again, I don’t think so. There a change in attitude in the air today which suggests I’ll happily be engaging with this technique a lot more from now on. It’s got me hooked, the evil thing. Now I’ve got that off my chest here’s a bit about the picture above. I was really happy by the look and feel of the “Catch me if you can” picture, the shape and composition, the background idea and the naughty hand gesture. Wanting to do another similar piece got me thinking and I realised it was the hand gesture that was holding my attention. It’s irreverent, slightly rebellious and hints to so many aspects of our lives on two wheels. It evokes great memories of shared teenage rebelliousness, our desire not to be dictated to by The Man and a general “Piss off” to the establishment. We’ve all done it at some point in time whether in jest or otherwise. Plenty of reasons in my mind for it to feature in some other pictures. You’ll notice I’m also still playing with the idea of the detailed street scene background. For me it’s a great way to get a bit of humour into the pictures and place the central character in a relatable context. Here’s a detail panel so you can see what’s going on in that section. For those of you who are not familiar with it, the “V” sign is an almost uniquely English thing, though it is apparently shared across some of the Commonwealth nations like Australia and New Zealand. Essentially it means “f*** off”, and should not be confused with the contemporary peace sign or the victory salute loved by a certain Mr. Winston Churchill, where in both cases the back or the hand faces the giver rather than the receiver. With the back of the hand facing forwards, this becomes a potent symbol of abuse. No One really knows where it first came from, but the most popular myth is that it was used by English long bowmen during the 100 years war with the French, a lengthy conflict spanning the 14th and 15 centuries. It was said that captured archers had their bow string fingers cut off by the enemy, so on the battlefield the English archers would wave their fingers at the French to taunt them and show that they still had them intact. It’s a great story but, as I said, no one knows if it’s true. Thanks for dropping by today and I hope you enjoyed the post.